Superior in both meat trait and growth. His sire, “Haruki 2 (IMP JAP)” was born on April 24, 1992 in Yamanashi Prefecture and has always remained in the shadows of his paternal brother “Michifuku (IMP JAP)” over the years. Since Breedplan was established in Australia, “Haruki 2 (IMP JAP)” has become a breed leading sire for gestation length, 200 day weights, 400 day weights, 600 day weights with a superb IMF (intramuscular fat) score of +0.8. His dam, “Okutani (IMP JAP)”, is one of the “original three” WKS girls who died shortly after her arrival to the USA – after just two flushes. 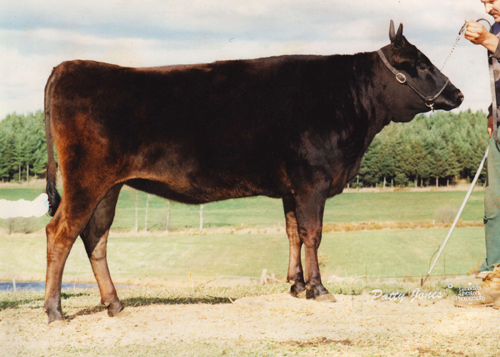 Okutani (IMP JAP) was considered to have the most potential of the three due to her tremendous sire stack of “Okushige (IMP JAP)” x “Kikutani (IMP JAP)” x “Dai 7 Itozakura (IMP JAP)”. “Okushige (IMP JAP)” was Number 1 for BMS in Japan in 1990 (one of three full siblings to hold this honor) – “Kikutani (IMP JAP)” and “Dai 7 Itozakura (IMP JAP)” are still considered two of the top 10 sires ever in Japan!! 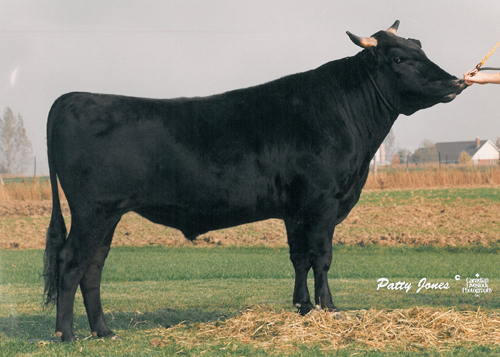 “Genjiro (CAN)” would be a full brother to FB2289 – Beijiro (USA) (who is currently commanding $200 / straw) and a 3/4 brother to Overflow Mihashi (AUS). In time, Breedplan will show that “Genjiro” to be superior in both meat trait and growth scores than Mihashi.